Before you get a puppy, ask yourself a few questions. Why do you want a dog? Will you have the time, space, and money to care for and play with your pup? Which breed do you want? Know the answers before you start looking because once you look, you probably are going to bring home a puppy! 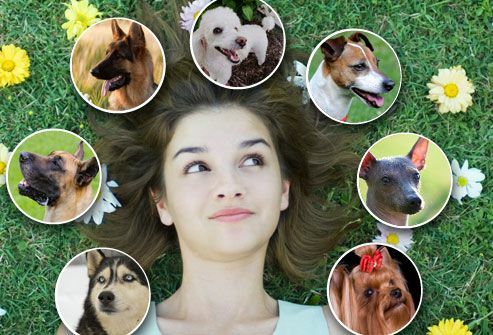 You have lots of options when choosing a puppy. Because there are so many homeless pets, it's great to adopt from a shelter, rescue group, or the pound. If you decide to use a breeder, the American Society for the Prevention of Cruelty to Animals (ASPCA) says to look for a small-scale breeder who never sells to dealers or pet shops. 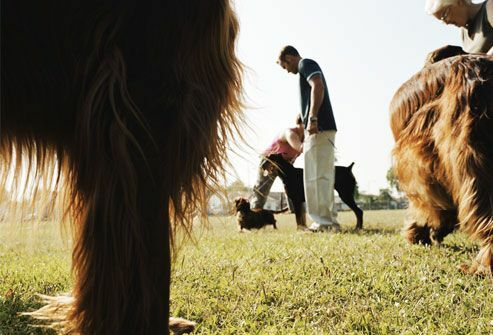 Visit the breeder's home and kennel and meet the mother or relatives of your dog. Like babies, puppies explore with their mouths. To keep her safe, you'll need to do a few things before bringing your puppy home. Move breakables and electrical cords from doggy level. Lock away cleaning supplies, motor oil and antifreeze, and medications. Get a securely covered garbage can for trash. Puppies need food specially designed for their smaller bodies. That's because a growing puppy needs more protein and calories than an adult dog. 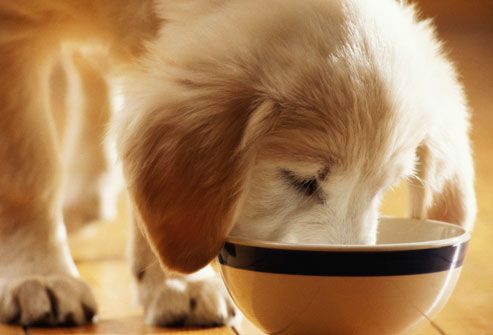 The food is also easier on a puppy's smaller mouth and weaker jaw. Don't forget that puppies also need plenty of fresh, clean water. How Much Food Does Puppy Need? Dogs will eat a lot if the food is available. That's why you shouldn't feed your puppy buffet-style. Plus it's good to watch what your pup eats so you can keep track of his health. How much food he needs depends on his size, age, and health. 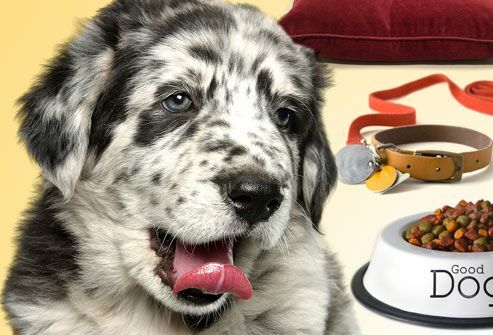 Ask your vet for advice on how much food to give your puppy. 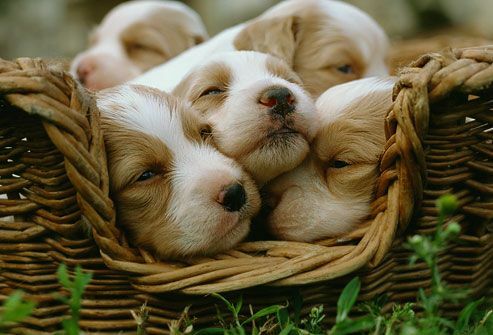 Puppies may sleep from 14 to 20 hours a day, so keep your pup comfy while she naps. 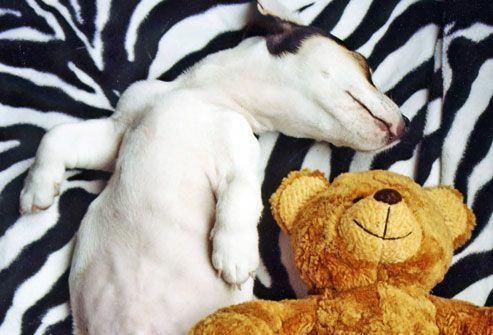 For bonding, many experts say your puppy should sleep in your bedroom at first, whether in her own bed or a crate. If you use a crate, use it only for sleeping, housebreaking, and travel. 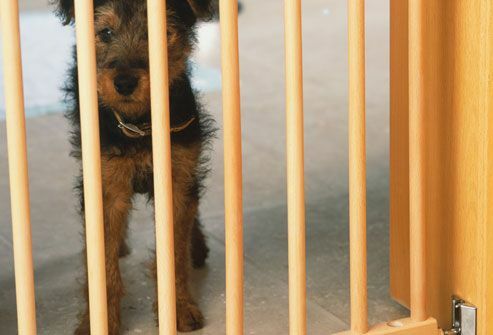 Dogs aren't meant to live in crates, so don't overuse it by closing your pet in all the time. But do leave the door open. Lots of dogs see the crate as a safe place and find comfort in being able to go in and out at will. Dogs are happiest when they're with their pack -- which might be you. If you keep your dog outdoors often, always make time for daily walks and play. 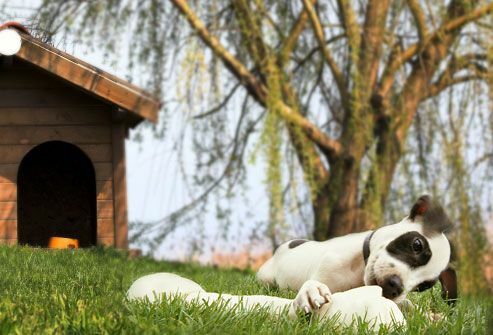 Keep your dog safe with a fenced yard. Be sure it has a covered, dry, draft-free spot to keep him warm, and a shady spot to keep him cool. Make sure he has plenty of fresh water. Your puppy's first days in her new home are a big adjustment, so give her lots of loving attention. Play with her often. Bring her bed or crate into your bedroom at night so she can be close to you. Soon after she settles in, schedule her first vet visit. 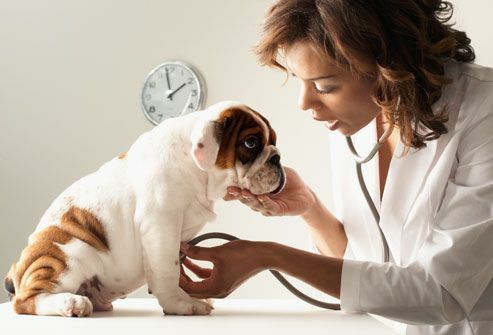 Your vet can answer any questions you have and will make sure your new pet has no health problems. There are two signs your pup needs to potty. He'll sniff the ground to find a good spot, or he'll race around wildly. When you see him act this way, pick your puppy up and place him outside. After he’s peed in the right place, praise him. Puppies relieve themselves every few hours, so expect a few accidents. You can train him to use potty pads inside, too -- just make sure you’ll be OK with him using them for good. Keep them in the same spot if you go this route. Even if you can teach your puppy yourself, you might want to take your puppy to obedience classes. She'll get to be around other dogs and will have to listen while there's a lot going on. Plus, it will nudge you to do your homework and keep working with her. With a little time, kindness, and patience, you can teach your rough-and-tumble puppy better behavior. Playing is fun! 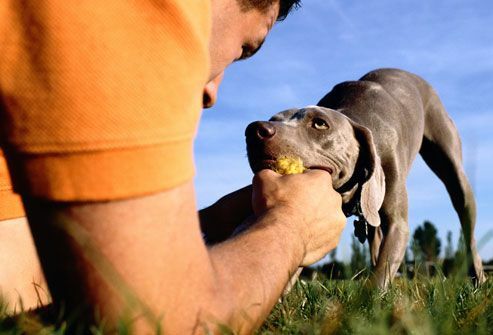 Spend time every day playing with your pup because it helps her in many ways. She gets rid of energy, works on coordination, and bonds with you. When you play, use toys. Don't use your puppy's leash, your hands, or anything else, or they'll get the wrong idea. Even if your puppy has a great yard, you'll need to take him for walks. 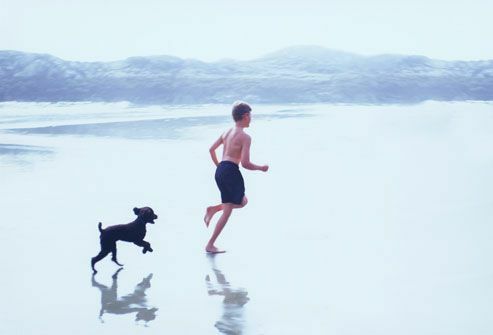 Walks give dogs physical and mental exercise. It lets them interact with other dogs they meet along the way. Plus it lets them leave scent markings, which dogs like to do. Try to get at least 60 minutes a day, broken into two to four walks. And make sure your pet is properly vaccinated to avoid picking up an illness while out and about. As much as kids and dogs love to play together, a puppy is still learning the ropes and may play roughly. There's also the chance that rowdy kids could play too hard with their pup. Watch puppies and kids at all times so they both stay safe. Brush your pup's coat daily. It will help her get used to grooming. Talk to your vet about the right brush for your dog's breed. Keep her nails short, as too-long nails can stress a dog's wrist joints as well as hurt people and furniture. 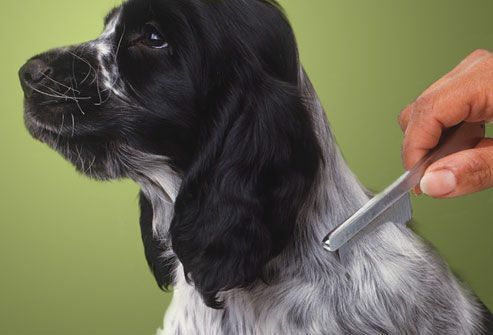 Trim nail tips weekly starting when your pup is young so she'll be OK with clipping. Your vet can show you how. 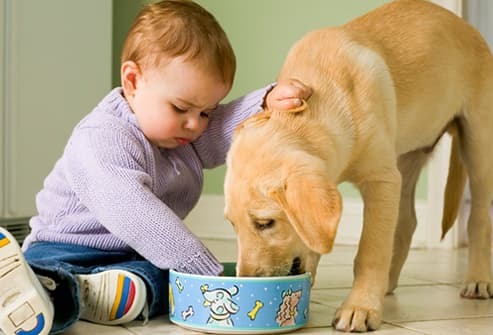 It's a bad idea to feed your puppy from your plate. Begging is a hard habit to break! 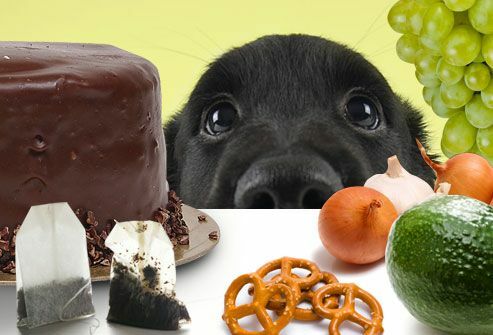 More important, some foods can be toxic to dogs, including grapes, raisins, alcohol, garlic, onions, avocados, salt, and chocolate. Call the Animal Poison Control Center at (888) 426-4435 or your vet right away if you think your pup has eaten something dangerous. Dogs have a hard time breaking down one of the key parts of chocolate. 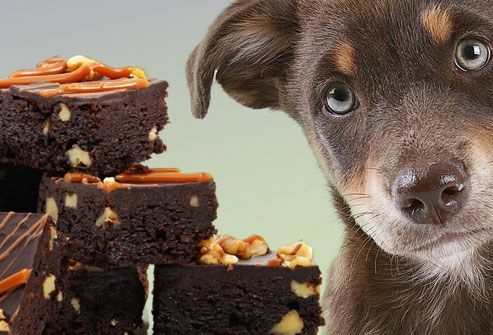 Baking chocolate is the most dangerous type of chocolate for your dog. Though a little bit of white or milk chocolate might not hurt, dogs tend to eat whatever food is around. So remove temptation and keep chocolatey things away from your puppy or dog. Call the Animal Poison Control Center at (888) 426-4435 or your vet right away to see if your puppy needs medical attention. Puppies like to chew on everything, including yard and house plants. 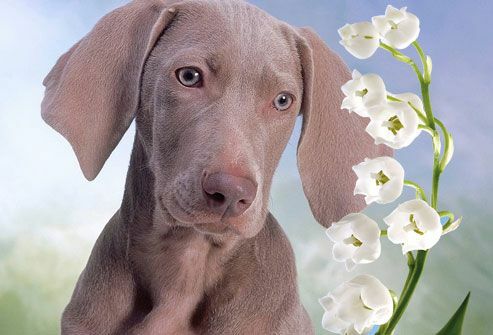 Some plants -- including lily of the valley, oleander, azalea, yew, foxglove, rhododendron, rhubarb leaves, and shamrock -- are risky for dogs. If you think your puppy has eaten a poisonous plant, call your vet right away or the Animal Poison Control Center at (888) 426-4435. 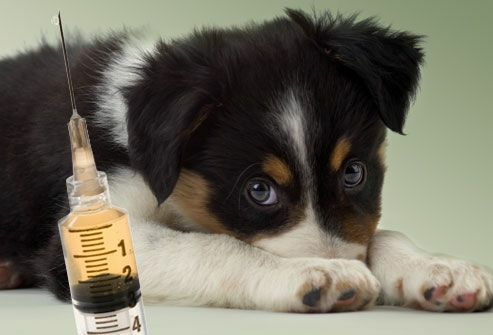 Vaccinations can help your puppy stay healthy. At 6-9 weeks it's time to get her vaccinated against distemper, parainfluenza, canine hepatitis, and parvovirus. At 12-16 weeks it's time to get her rabies shot. 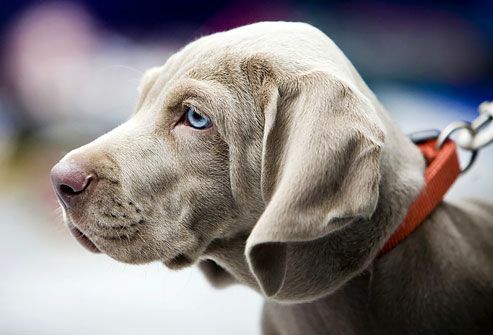 Other vaccine choices depend on your puppy's risks, so talk to your vet for advice. 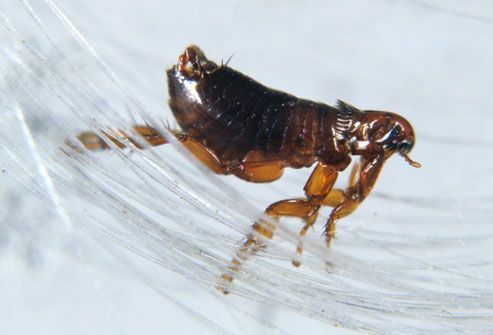 It takes just one flea to start the flea cycle in your home. Signs your puppy may have fleas include flea "dirt" (tiny black flea droppings), mild redness, severe scratching, and skin infections. To fight fleas, ask your vet for flea control that's safe for puppies. Treat all pets in the house for fleas, not just the one that may have them. 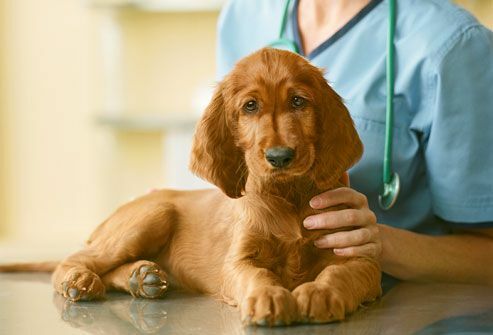 Your puppy will probably need deworming medication at his first vet visit. This is a good idea for his and your health since some dog parasites, like roundworms and hookworms, can also pass to people. 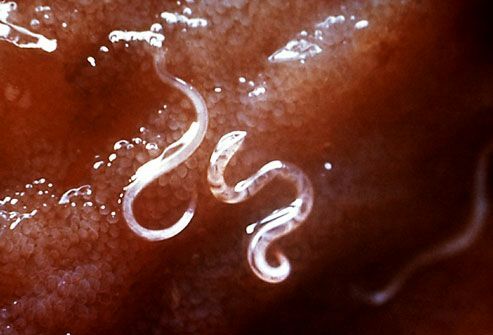 Nearly all puppies have roundworms and hookworms (magnified here). 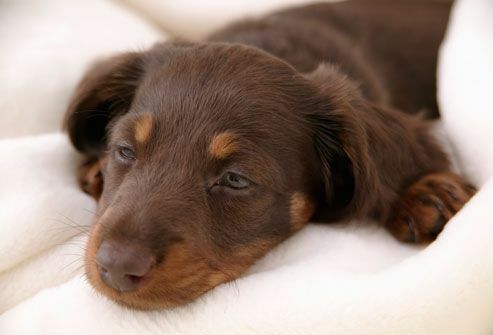 Intestinal parasites are potentially deadly to your pup if untreated. More than 6 million dogs and cats find their way into shelters every year. That's why it's a great idea to spay or neuter your puppy. Spaying can be done as early as 2 months old, but most vets wait until age 4 to 6 months. If cost is a problem, call your local humane society or shelter. Or call (800) 248-SPAY to find a low-cost spay program near you. Dogs often won't show it when they're feeling bad. They do their best to stay social when their owners are around. 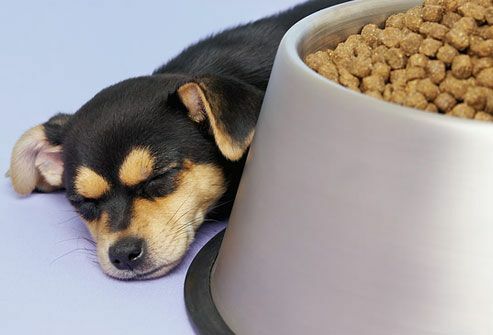 You may notice some common signs of illness in puppies and dogs, such as not eating, eating less, vomiting, coughing, sneezing, fever, diarrhea, or sleeping more. If you see any of these signs, call your vet. Ask friends for recommendations. Once you have a few names, visit each clinic. Pick one that's well-managed and looks and smells clean. The vet should listen to you and answer all your questions. Is the staff friendly? Just as with your own doctor, be sure you feel comfortable with the vet you choose. Puppies don't stay little for long! It's a special time that you'll treasure long after your puppy grows up. So make every day count for you and your little one with plenty of love, appropriate discipline, and play! 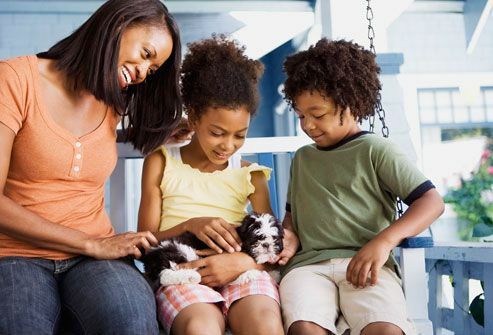 American Veterinary Medical Association: "What You Should Know About Household Hazards," "What You Should Know About External Parasites," "What You Should Know About Choosing a Veterinarian for Your Pet." ASPCA: "Where We Stand on Puppy Mills: The ASPCA's Policy and Positions," "Finding the Right Vet." Benjamin, C. The Chosen Puppy: How to Select and Raise a Great Puppy From an Animal Shelter, Howell Book House, 1990. Linda P. Case, adjunct assistant professor, College of Veterinary Medicine, University of Illinois; author, The Cat: Its Behavior, Nutrition & Health; co-author, Canine and Feline Nutrition. Carrie Damewood, DVM, Cottage Grove, OR. Davis-Wurzler, G. Veterinary Clinics of North America: Small Animal Practice, May 2006. Fogle, B. ASPCA Complete Dog Care Manual, DK Publishing, Inc., 1993. Humane Society of the United States: "What to Consider Before Adopting a Pet," "How Pets Help People," "Choosing a Veterinarian." Johnson, N. The Complete Puppy & Dog Book: All You Need to Know to Keep Your Pet Healthy and Happy From Birth to Old Age, Galahad Books, 1977. Klever, U. The Complete Book of Dog Care: How to Raise a Happy and Healthy Dog, Barron's Educational Series Inc., 1988. The Monks of New Skete. The Art of Raising a Puppy, Little, Brown and Company, 1991. Veterinary Partner: "Crate Training Puppies." National Institute of Allergy and Infectious Diseases: "Parasitic Roundworm Diseases." Wrede, B. Before You Buy That Puppy. Barron's Educational Series Inc., 1994.